Grilled Huli Huli Chicken - DANGEROUSLY good!!! 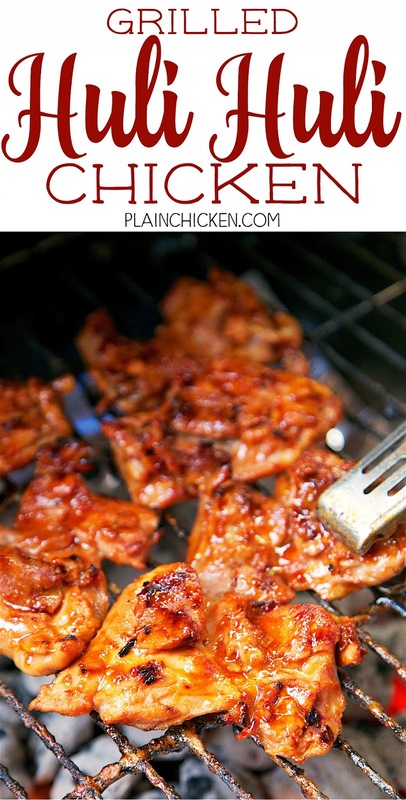 Chicken thighs marinated in brown sugar, soy sauce, ketchup, sherry, ginger, and garlic. Let the chicken marinate all day and grill. We ate this twice in one week. It was seriously delicious!! 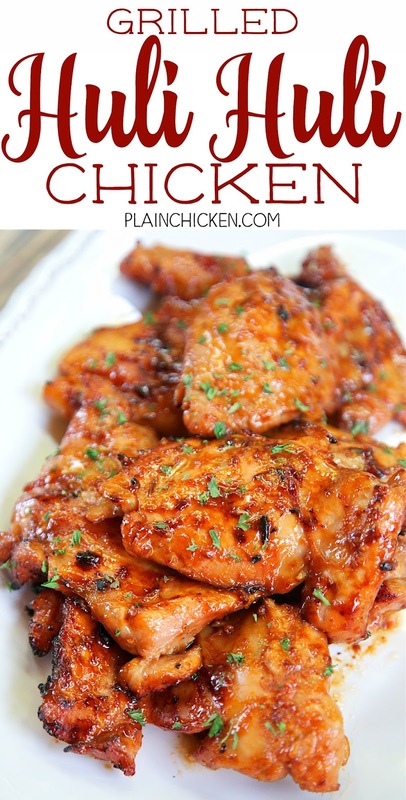 Can use chicken breasts or tenders instead of thighs. This Grilled Huli Huli Chicken was the best thing we ate last week. Chicken Legs loves chicken thighs, so when I came across this recipe in one of my old cookbooks I knew I had to make it for him. It was SO good that we actually made it twice! 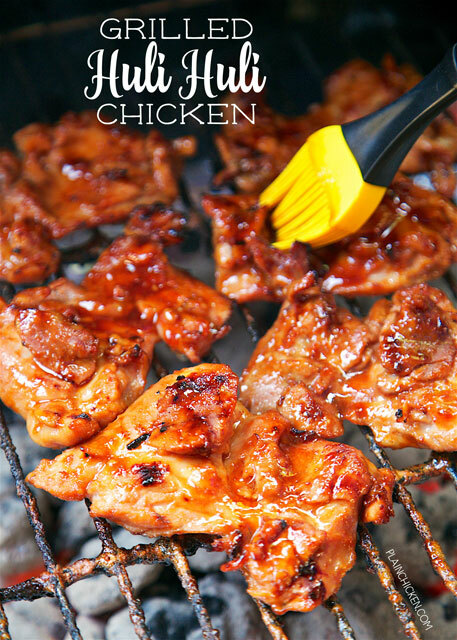 The chicken is marinated all day in a quick Hawaiian BBQ sauce. It is seriously delicious! I used dried ginger in the marinade, but feel free to use fresh ginger. I am not a huge ginger fan, so I didn't use a lot. If you love ginger, bump it up in the marinade. We used chicken thighs in this recipe. 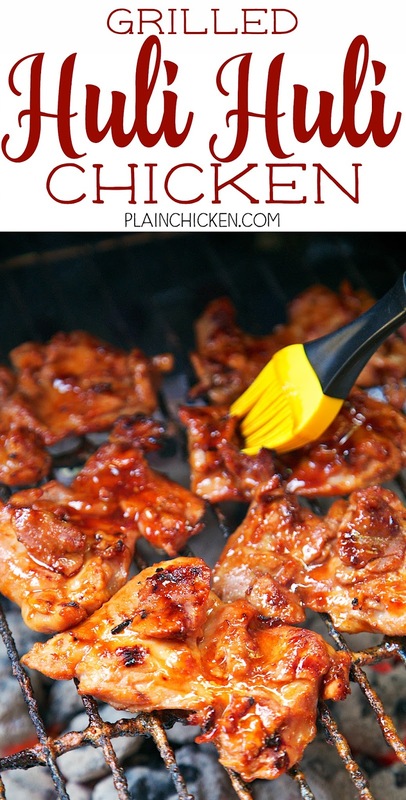 If you aren't a fan of chicken thighs, feel free to use chicken tenders or breasts. I am going to make it with chicken tenders this weekend. YUM! Make sure to brush the chicken with all the reserved sauce - the sauce is way too good to waste! In a small bowl, mix the first six ingredients. Reserve 1/2 cup for basting; cover and refrigerate. 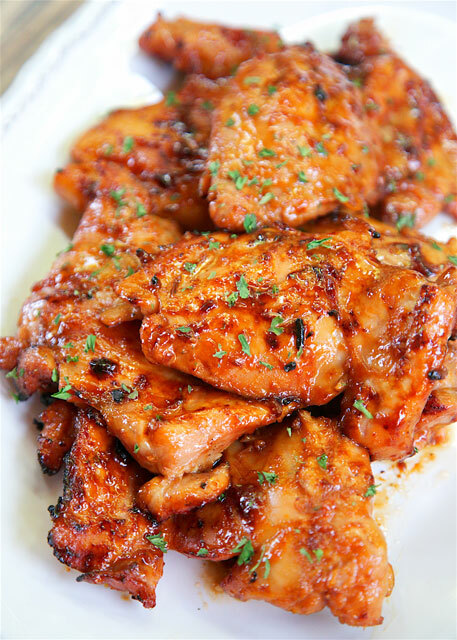 Remove chicken from marinade and grill until done, approximately 12 to 15 minutes. Baste chicken with reserved marinade during the last 5 minutes of cooking. The photo makes me want to reach into my screen. Seems very easy & without much parafonia. I will certainly try tis week end. Thanks. This was seriously soooooooo good. I could only fit 10 pieces in my bag. They were a little big. I doubled the sauce though. Half to marinade and the other half to pour over when done. I love it poured over rice. Its even better the next day. Definitely making this again and again. So easy to prepare as well. Thank you so much!